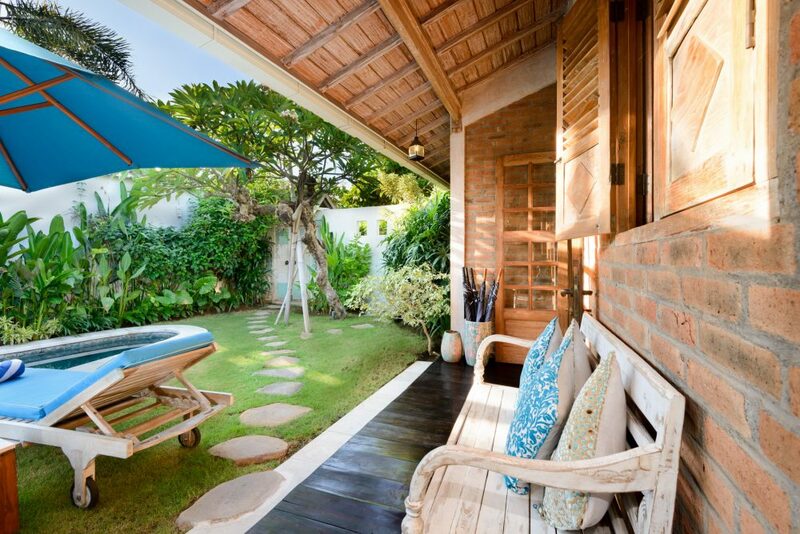 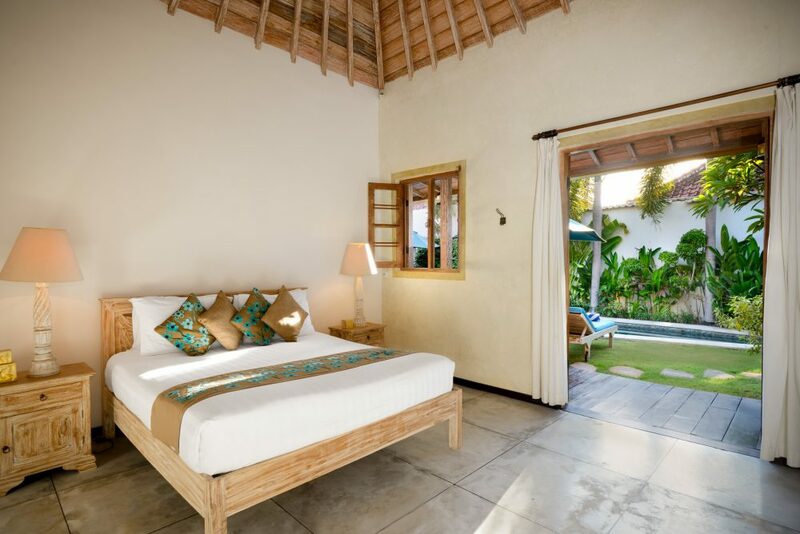 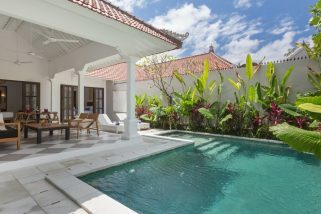 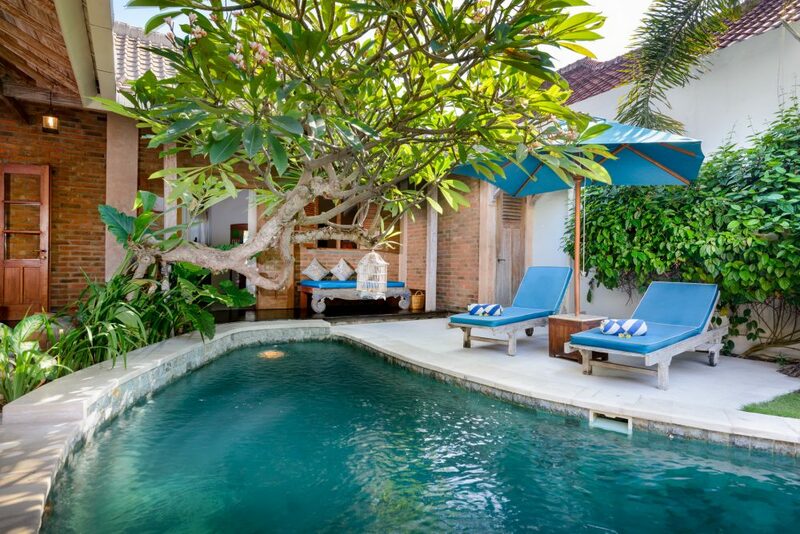 Villa Amsa is a lush three-bedroom private pool villa located in the heart of trendy Seminyak. 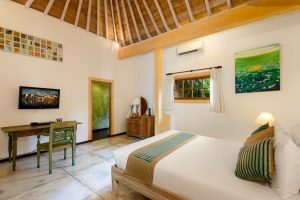 It’s a marvelous choice for those who want to stay somewhere serene and private while still enjoying easy access to Bali’s buzzing nightlife.The villa interiors bring together pops of color with carved wood and stone elements in a style that’s both chic and rustic. 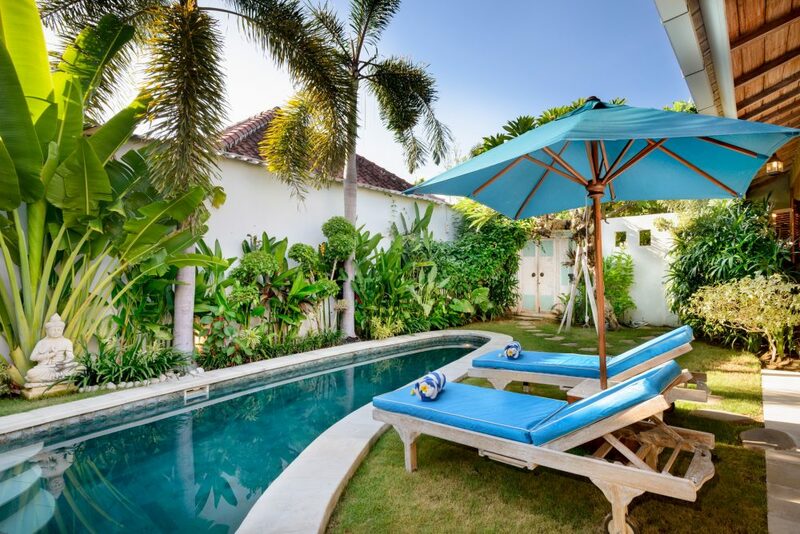 Villa Amsa is located in the heart of trendy Seminyak, the best choice for those who want to stay in a serene and private place while still enjoying easy access to Bali’s buzzing nightlife. 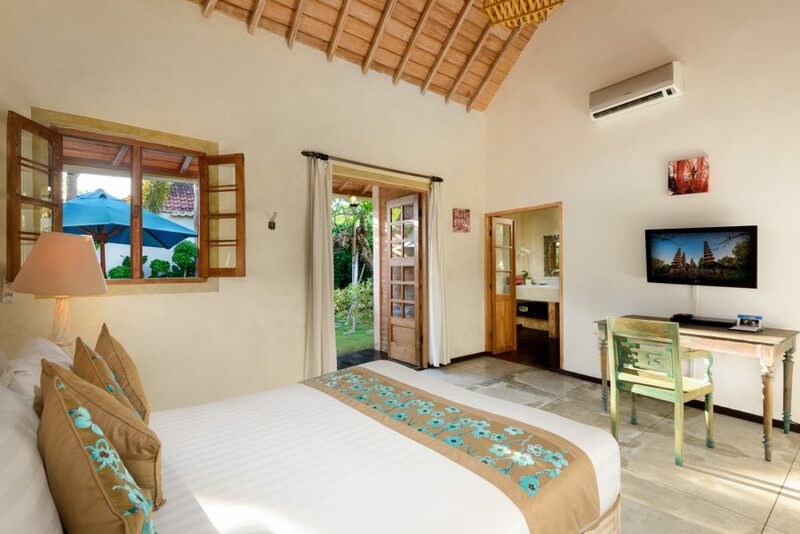 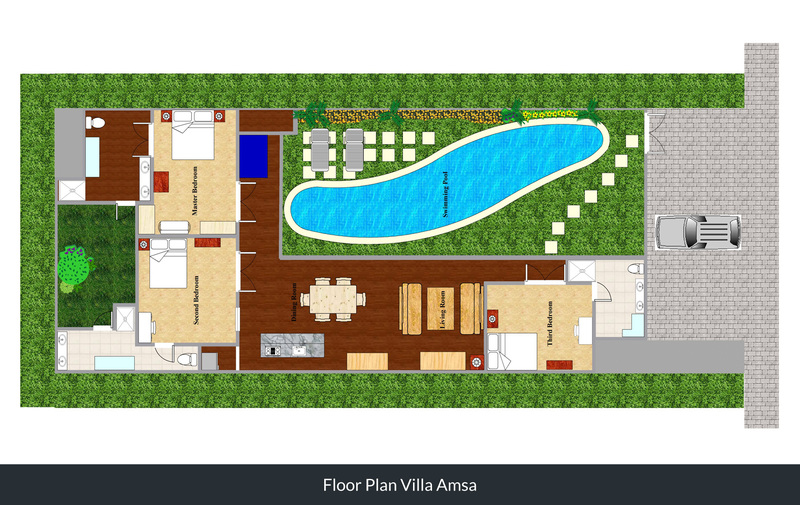 All of the generously sized bedrooms at Villa Amsa exude luxury and comfort. 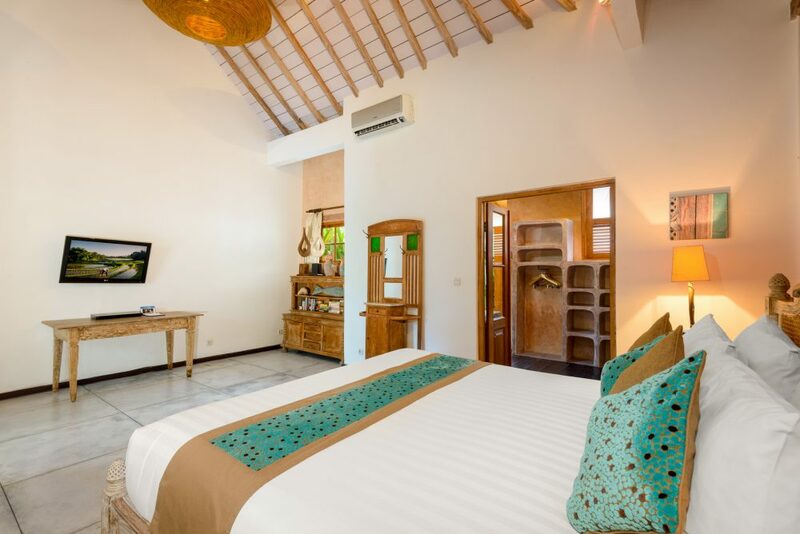 The master suite is furnished with a deluxe, king-sized bed while the other two contain queens. All bedrooms are air-conditioned and come with flat screen TVs, DVD players and safety boxes. 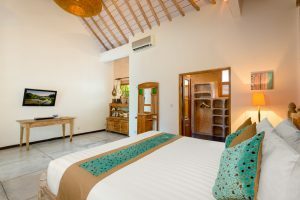 There are also inbuilt wardrobes so you can tuck away all of those new purchases and a small desk area if you need a quiet place to Skype your family back home. Step into the ensuites and you’ll be charmed by the indoor and outdoor style that’s typical of luxury villas in Bali. 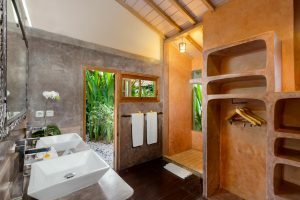 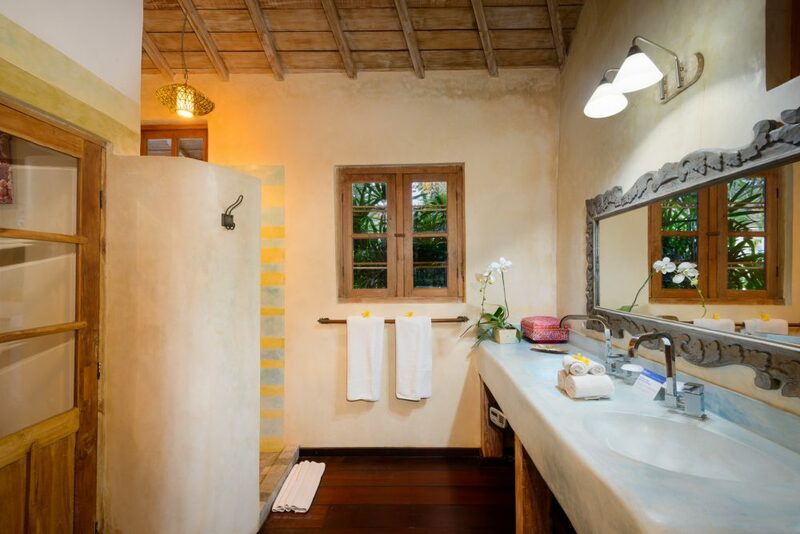 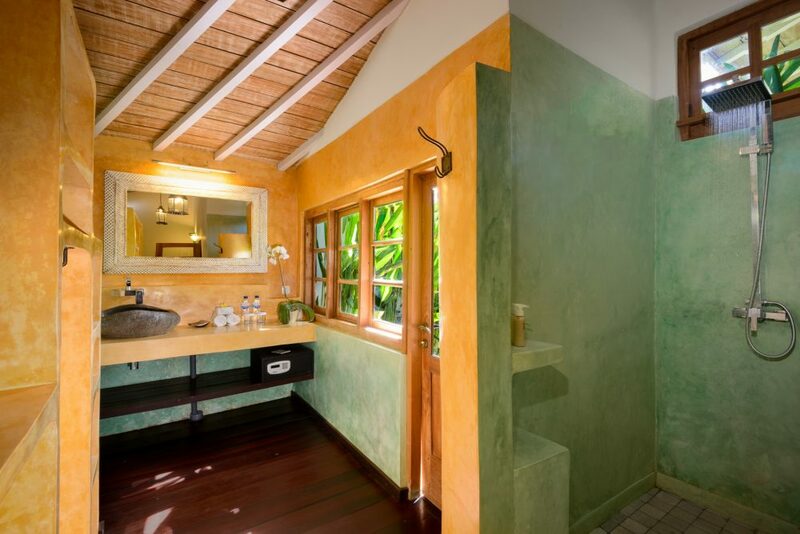 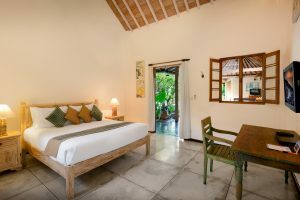 The bathrooms contain carved stone washbasins, high-pressure showers, fresh flowers and all the amenities you’d expect from a villa of this caliber. 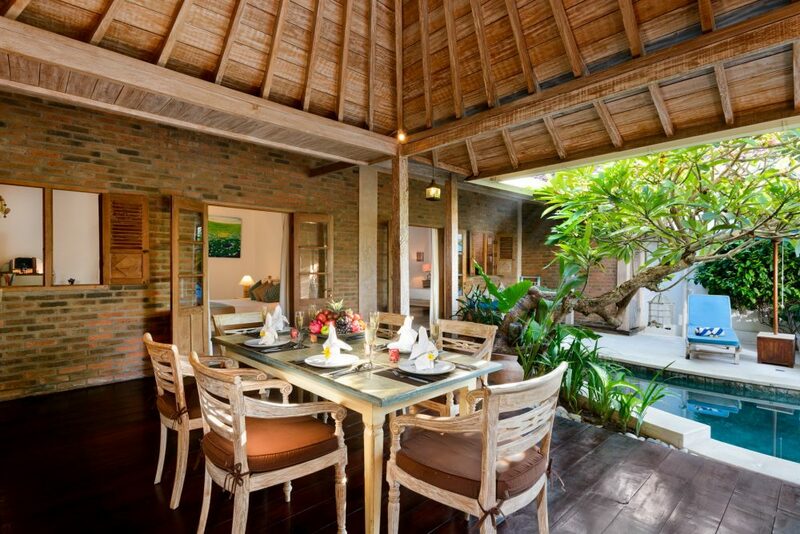 Inside you’ll find a solid wood dining table that accommodates up to six adults. 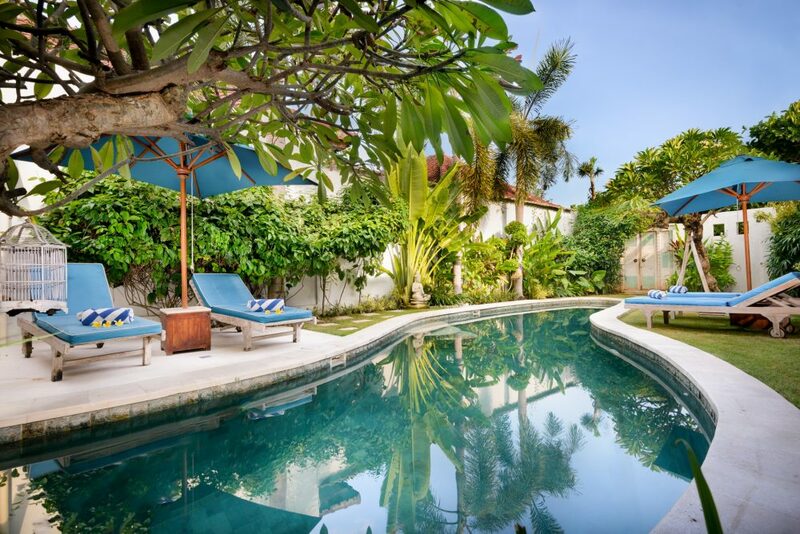 It looks out over the sparkling semi kidney shaped pool that spans the outside area. 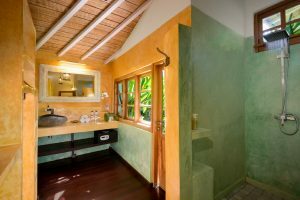 Indoors you’ll find solid wood floors and a stylish kitchen that is equipped with all of the appliances you may need to prepare food or snacks. 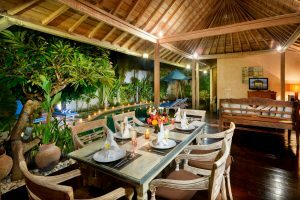 There’s a juicer, blender, toaster, microwave and more, but it’s just as easy to order in from one of the many world-class restaurants in the area if you’d like to go completely off duty. 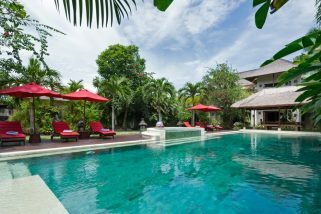 Just let us know before you come if you’d like to pay a little extra for our staff to stock the villa with the drinks and snacks of your preference. 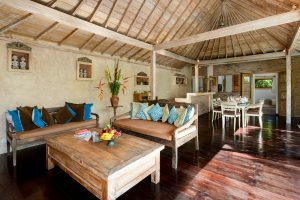 When it’s time to relax you can retreat to the lounge area for a snooze or catch up with your fellow travellers on one of the two adjacent daybeds. 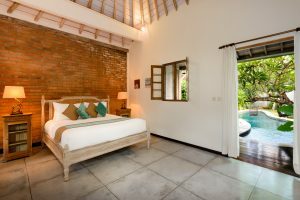 These offer a great view of the entertainment system and have soft furnishings to snuggle up to if you’re in the mood for a movie or there’s a big game on. 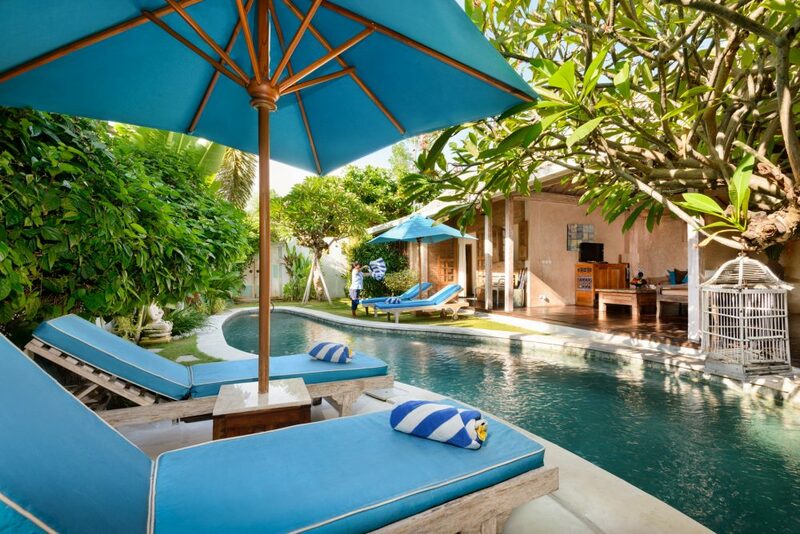 Outdoors there are several sun loungers and benches so guests have the option of lounging in the shade or soaking up the sun’s rays in between refreshing dips in the pool. 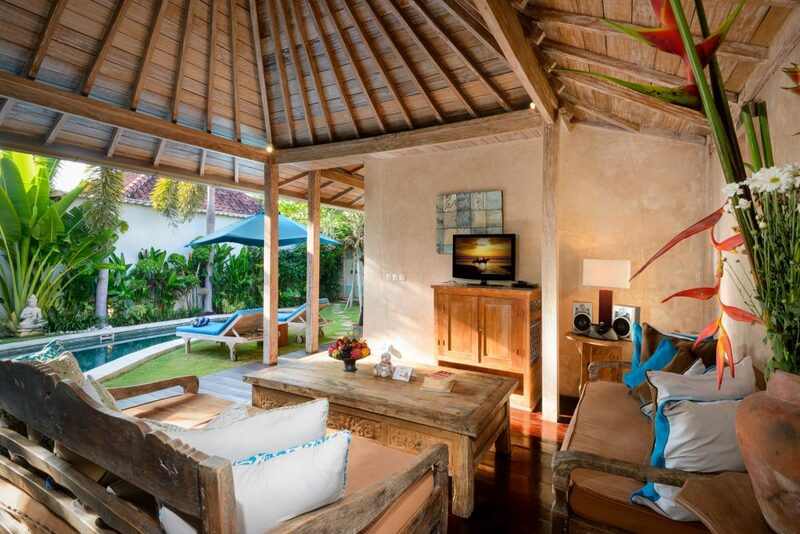 Your stay at Villa Amsa wouldn’t be complete without the warm hospitality of our Balinese staff. 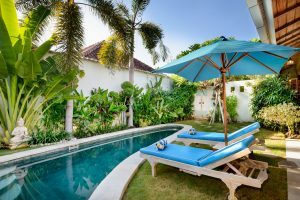 A housekeeper who comes daily, as well as a gardener and pool man will discreetly maintain the villa without disturbing your peace and quiet. For an extra fee you can arrange for babysitters, masseurs, in villa spa treatments, drivers and every other service you can imagine. 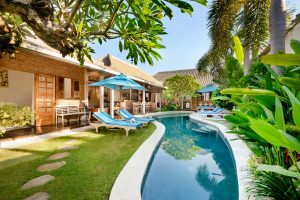 Villa Kalimaya I is part of a group of exclusive villas situated down a quiet lane and close to the best beaches and hippest bars within the ultra-chic shopping district of Seminyak on Bali’s southern coast. Villa Anggrek 66 is a compilation of 3 luxury villas set within tranquil, lush tropical gardens in the vibrant tourism district of Legian/Seminyak. 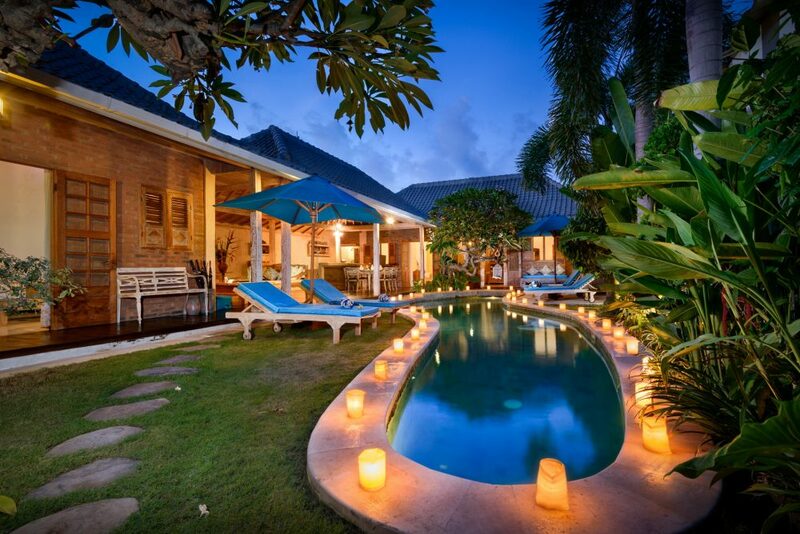 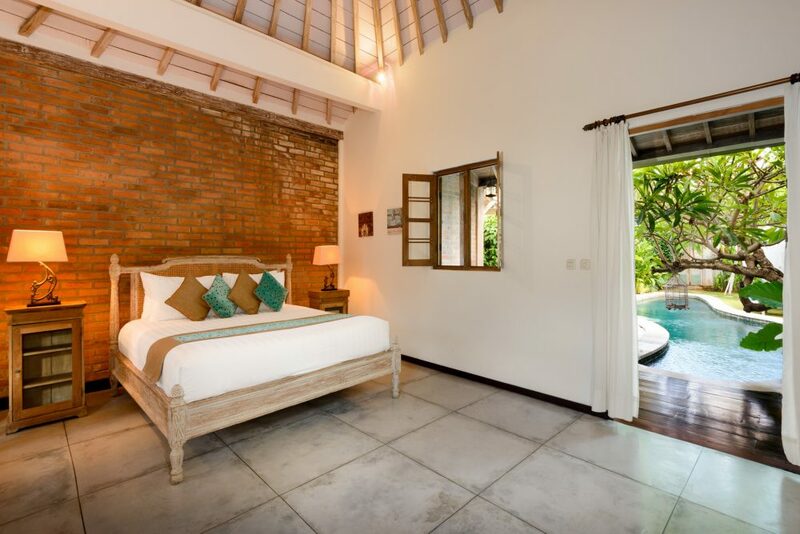 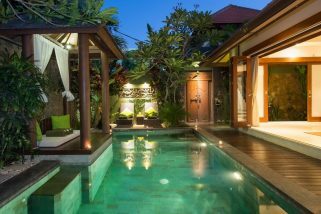 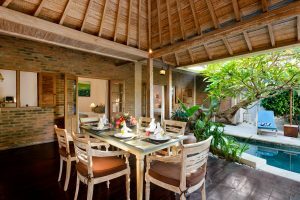 Villa CJ is a fantastic 2 bedroom Seminyak holiday villa rental located just off Jalan Drupadi. 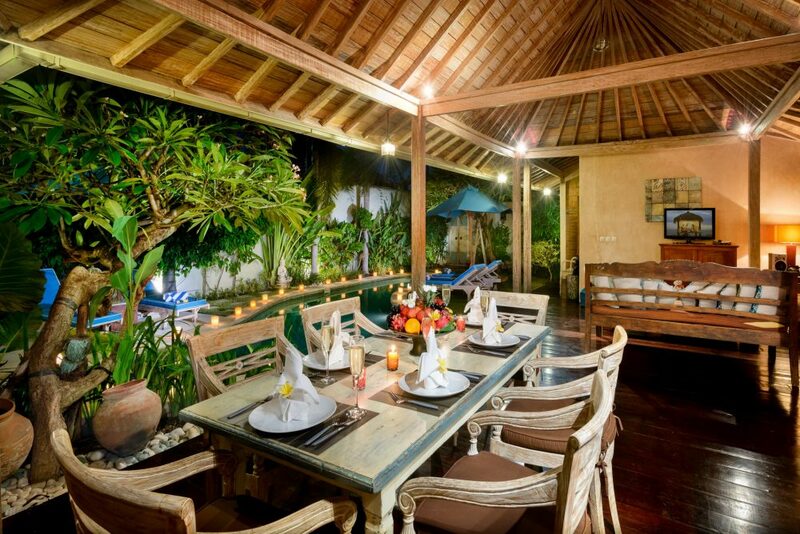 Villa CJ offers guests easy access to ‘Eat Street’ as well as Gado-Gado Beach at the end of Jalan Camplung Tanduk, well known for the vibrant & popular beach bars.